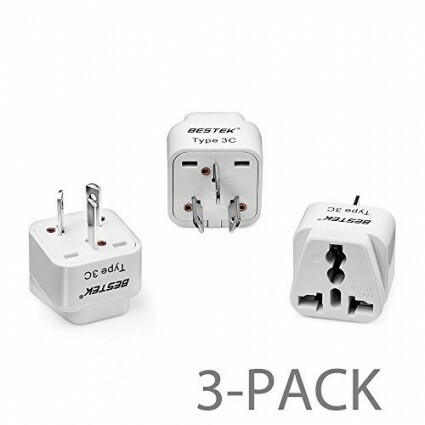 BESTEK power 3-pack adapter plug with high performance and universal design, durable and safe, are a nice travel companion for you no matter which country you go. The plug adapters are made of internal metal interfaces offer good conductivity and it is durable enough with long lifespan. Please do not use high power electric devices such as hair dryers, electric heaters and curling irons on these adaptors. • Ecuador, El Salvador, Guam, Guatemala. • Nicaragua, Okinawa, Panama, Peru, Philippines, Puerto Rico. • USA, Venezuela, Virgin Islands.